TESTIMONIALS | Vetter Productivity, Inc. The Vetter Way has saved my life in the past year! The Vetter Way has saved my life in the past year! I took on a different position at work which is more demanding, with more information coming at me and more interruptions than ever before. Even though I struggle every day with my bad habits, at least I have the knowledge of a good system at hand to help me get back on track (and maintain my sanity!). The only time the Vetter Way doesn’t work for me is when I don’t use it. Thanks, Greg. Of all the productivity gurus out there you’re my favorite. It’s the best decision I have ever made relative to my work environment. ...since working with Greg my business has completely turned around. I was facing a very challenging time in my business. I was unable to keep up with the onslaught of requests coming in. I was losing business because I could not respond to the emails coming in and get my actual work done. Things were getting desperate. Greg Vetter came in and showed me how to manage the onslaught of emails and requests coming in. His system allowed me to get to “Inbox Zero” every night! AND I have time now to handle my real job! I am very grateful to report that since working with Greg my business has completely turned around. I cannot say enough how thankful I am to have found you, and brought you on board to improve my productivity. I’ve been through many seminars on time management and the like, and your consultation is one of two life changing experiences I have had in my professional career. 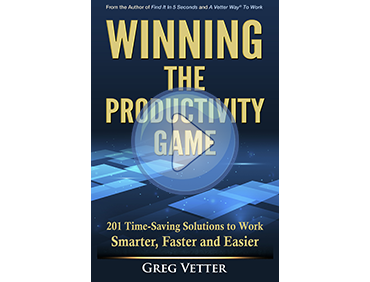 I now have been using Greg Vetter’s organizational system for one year, and in that year have found that my organizing, planning and productivity levels have skyrocketed…The ultimate compliment I can pay regarding this system is the fact that I am now arranging for each of my 18 new direct reports to be “Vetterized” in order to increase our team’s productivity. ...the amount of work that I can now do for the bank has doubled. We all work hard at NationsBank, but I can safely say that the amount of work that I can now do has doubled. Vetter Productivity has given me at least two more hours of work time each day. ...the most direct impact on my productivity. I found your course to offer the most direct impact on my productivity, than any other training course or seminar I’ve attended. ...Vetter Productivity was cited as one of the strengths of our operation. The work you have done with our team to develop “lean office” work flow and record keeping practices has increased our productivity and the accuracy of our information. Our audit was very successful with the auditors describing our operation as the new “gold standard” for the Coca-Cola operations. CSP was the first operation to have “Strengths” identified and our implementation of Vetter Productivity was cited as one of the strengths of our operation. The auditors were impressed at how quickly (5 seconds) we could produce the instrument calibration, analytical results, COAs, lot information, etc. that they audited. My production is up over 70% since you began working with me. In two days’ time I accomplished what previously would have taken me a week to accomplish. ...really making a difference in people’s lives. Congratulations on and thank you for an outstanding performance. Greg, what you are doing is really making a difference in people’s lives. I can put my hands on anything I need within a fraction of a SECOND. Thank you for helping me create a work environment that WORKS! I can put my hands on anything I need within a fraction of a SECOND. This is exciting stuff. Not only do I work better, I feel better because I am in control. I asked someone to time me... It took only 11 minutes. Recently we had new carpet installed. Each person had to pack everything, except furniture, in boxes, place them in the hall and reverse the process the next day after the carpet was installed. It took me 30 minutes to pack my office in boxes, mark them and move the boxes outside my office. I asked someone to time me the next morning when I restored my office. It took only 11 minutes. Some employees spent days restoring their office. As I have assumed additional responsibilities and travel more, I would have been totally lost and overburdened without the Vetter Way. Your system is an organized approach to living and succeeding in a very busy, over-communicated, technical world. With all the memos, e-mails, faxes, phone calls and people coming at me each and every day, your system provides order, solutions, and a way to function with a positive mind and attitude. Hands down – YOUR’S WAS THE BEST! I have spent the last 22 years with three major corporations: Proctor and Gamble, Kayser Roth and Coca-Cola. During that career I have participated in excellent training seminars and workshops. Hands down – YOUR’S WAS THE BEST! ...it has changed my life. This comes to thank you for your productivity seminar–it has changed my life. I’ve earned more than I’ve paid him in the time he has saved me. It’s difficult to measure all the time and effort he saved, but I roughly calculate that the new system–in force for nearly two months–has added no less than 1 billable hour each day to my workday. I’ve earned more than I’ve paid him in the time he has saved me. Weinstein, Rosenthal, Tobin & Caldwell, P.C. The system’s greatest benefit is not that my desk is organized, but that I have clarity of mind to focus on priorities and not get sucked into the evils desk management that add no value. The participants are still talking about how helpful your system will be in their office. I appreciate the time and effort you obviously put into the presentation. It was well organized and professionally presented in an interesting and energetic manner. I feel I am about 20% more productive. Productivity has increased by twenty-five percent. ...very relevant to the work place. Unlike a lot of highly-promoted seminars available which promise grandiose results, your program is specific, disciplined and very relevant to the work place. Your system is simple yet quite effective. Your system is simple yet quite effective. I wish I could change all of my bad habits as easy as you helped me change my organization skills. I wanted to take the time to thank you for making the best investment in myself and my business that I have ever made. ...but this is the only one I would recommend. I probably only use the program at 75 percent of its capacity and it has made an unbelievable difference…I could be a spokesman for your company because I feel so strongly about how much more efficient it has made me… I have had many time management classes and seminars in my career but this is the only one I would recommend. ...you’ve given me a tool and a process which are really working. Now that I count myself among the ranks of the ‘converted’, I can honestly say I have improved my ability to: focus on priorities; delegate more effectively; communicate more clearly and concisely. In short, you’ve given me a tool and a process which are really working. ...hours worked per week has decreased from 75 to 55. The number of hours worked per week has decreased from 75 to 55. Awesome to say the least! I always thought I was pretty organized but knew I could use some improvement. What I did not realize is how much improvement I needed, I was happy finding stuff in five minutes and thought you were crazy with the thought to find it in 5 seconds! I will definitely be using many if not all of what we covered in our short 4 hour class. ...best trainings I have had in operating in our electronic age. I took your course at EPA a few years ago and it was one of the best trainings I have had in operating in our electronic age. ...quite an impact on our organizational style. Because of your hands-on-approach and clear presentation, you had quite an impact on our organizational style. I would highly recommend this system to anyone who is trying to gain some sanity and bring some control into their life. ...my work environment has been truly transformed. There is no doubt in my mind and the mind of others who walk into my office in amazement, that my work environment has been truly transformed. I learned more...than in my total M.B.A. program. In these important areas of need, I learned more and was helped more by you in our twelve hours of intensive effort together, than I did in my total M.B.A. program. Thanks for the kind words and good wishes Greg. You have left an indelible mark on my life and for that I am grateful. I will stay in touch. I am already seeing huge benefits! I really enjoyed your presentation at our conference the other day and have already started using Outlook for my action items as you suggested. I am already seeing huge benefits! I wish I had heard that message years ago! Thank You! ...one of the most valuable days of my life. Thank you for one of the most valuable days of my life. I have to admit, I was skeptical at first. But your system does work. I now feel completely in control of my work environment and not so victimized. In using your organization system, my productivity and that of my secretary has increased tremendously. I have never been so productive. I am still using the system. I have never been so productive. Thanks for your help, especially your follow-up after our sessions. I am very much aware of your sincere interest in helping your clients achieve success with your program. Just a quick note to say your system saved us money and time and everything for a decade at the NBA. NOW it has done the same for my Dean of Students office for the last decade! If you work in my office you must use the Vetter Productivity System! Just thought I’d let you know how universal, transformational and helpful all your teachings and learnings with me still are! ...changed our organization... in a number of positive ways. 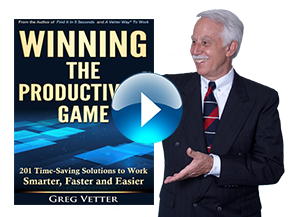 The Vetter Productivity System is a comprehensive and thought-out plan for personal and organizational productivity which changed our organization and our employees in a number of positive ways. I can easily recommend Greg Vetter as a person whose product is sound and whose approach is solid. We began the year at approximately a 20% rejection rate. We challenged the team with a mid-year goal of bringing this down below 7% and they have achieved it!! As a complex we have reached a rate of 5.89% leading the Region which overall came in at 9.37%, the Division at 9.56%, and the Firm at 10.35%. ...better system for how I work. Understanding the difference between processing and producing and separating those tasks was huge for me. Giving up working from my In-Box has been an eye opener. Unplugging every day to produce has been great. In addition I’m getting better at “batching” work and it’s downright exciting to become more efficient. I’m more effective now, contributing at a higher level, and I have more time for good decision making. I now have a system of not only organization – but a better system for how I work. ...what I learned ... was life changing for me. I wanted to let you know that what I learned in your training session was life changing for me. I’m being very serious. I did what you advised, customized it to fit my work life and have been doing and managing my work load so much better. I even have applied some of it to my home life. I just want to say thank you for teaching me how to change the way I “THINK” about working in both work and life. I wish I could teach this to my son but he is only 1 yrs. old. Please note that the change for me wasn’t an easy one – I had to work on it but it has been so worth it!